After trying many times, finally, I captured black bears!! It was yesterday morning, my friend called me because a bear family was hanging out on the tree in front of her house! 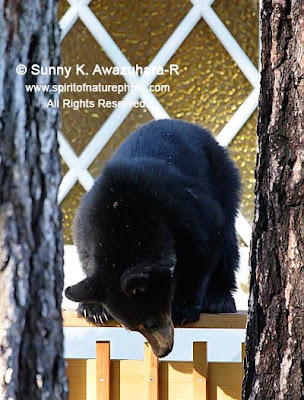 When I arrived at her house, 2 cubs were still high up in the tree. One cub was dark black, and another cub was dark brown. The big mom, also dark brown, was waiting for them down under the tree. The cubs slowly came down, and landed on the neighbor’s porch. They seemed to be confused on the fence. The mom was walking around. Her body language was telling the cubs, “Come on kids, let’s go.” The cubs seemed to be stuck on the fence. They were nervous to jump down. I wish I could have observed a little longer, but the neighbor insisted me to leave… Anyway, it was exciting to see my first Tahoe bear! 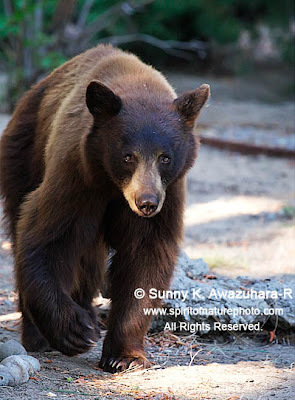 There are large numbers of black bears living in the Lake Tahoe area. Many of them do live around the residential areas. I heard about so many bear sightings in the backyards since I moved here. Sadly, not all people here don’t manage their waste for bear proofing containers, so bears here habituated with trash. 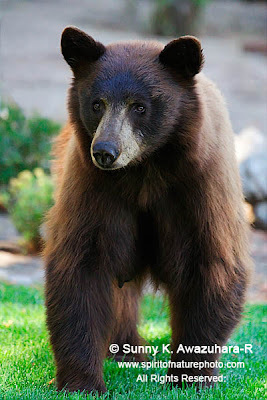 Many people have seen bears the neighborhood on the night before the garbage collecting days. Bear management (=waste management) is a common topic on the local newspaper in here.